Recently, I placed a small order at Fyrinnae.com after seeing a couple posts by Mandy @ Prettymaking. Her swatches were awesome and I fell in love with the lip lustres - specifically Type A. So I just had to place an order for a few mini lip lustres and loose eyeshadows. Like I said before I am so weak to makeup temptation K ... Makeup addiction is a wonderful thing right?!?? And the minis were reasonably priced. Resistance is futile! Today I am just showing you the lip lustre minis - I didn’t want to overwhelm your mind or computer with a tonne of pictures and swatches! When I first placed my order I was like holy poo they sure have a long shipping time frame – 16 to 26 days. But my order shipped 4 days after being placed. I guess they are just cautious. Fyrinnae sells mini samples of most of their products. 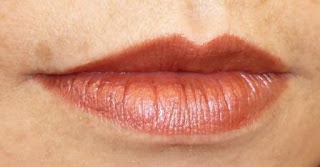 The lip lustres minis, $2.00, have 1.5 ml of product – enough for about 5 uses while full sized is 8ml for $6.00. Ingredients: Mangifera Indica (Mango) Seed Butter, Simmondsia Chinensis (Jojoba) Oil, Mica, Caprylic/Capric/Stearic Glycerides, Orbignya Oleifera (Babassu) Seed Oil, Ricinus Communis (Castor) Seed Oil, Euphorbia Cerifera (Candelilla) Wax, Iron Oxides, Tocopherol Acetate (Vitamin E, as a natural oil preservative), Flavor (lip-safe fragrance). May contain: Titanium Dioxide, Tin Oxide, Manganese Violet, Synthetic Flurophogopite, Calcium Aluminum Borosilicate, Calcium Sodium Borosilicate, Polyethylene Terephthalate, Red #28, Red #21, Red #27, Yellow #5, Blue #1, Red #40, Polyester-3. Ooooh, I'm going to check these out now! Haha, I'm glad you threw in the pronunciation. I think I needed that! They are awesome! My co-worker cannot stop smelling them LOL now she wants to buy some when I order the full sized ones. I should mention that shipping was CHEAP to Canada. I bought $20 of minis and shipping was like $3.25. WOW!